For James Baldwin’s many devotees, Jimmy’s Blues and Other Poems is representative of the American novelist and essayist we all know: the narrative voice in Go Tell It on the Mountain (1953) and the unabashed writer-activist of The Fire Next Time (1963). As we look back to what we know of Baldwin’s work and style, Jimmy’s Blues (2013) shows us the parts of his writing that have been overlooked: a poetic speaker, for instance, who brings blues and jazz into the sounds and stories of this collection. 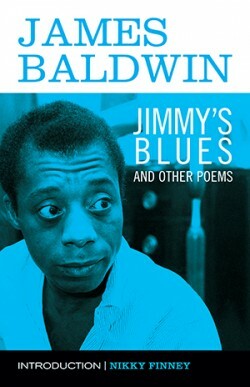 When Beacon Press published the first edition of Jimmy’s Blues in 1983, four years before Baldwin’s death, the majority of Baldwin’s readership did not perceive him as a poet. He was instead considered a strong, clear narrative voice and a witness to how Americans hated and loved one another. This collection is emblematic of the narrative flow Baldwin brings from his fiction and non-fiction into poetry; it is also evidence that as a novelist and poet Baldwin’s voice is always consistent. In 1987, James Baldwin died of esophageal cancer in Paul-de-Vence, France. His funeral ceremony was held at the Cathedral of St. John the Divine in Harlem, New York where Maya Angelou spoke about their life-long friendship, the way Baldwin was a true and loving brother. Amiri Baraka called Baldwin “God’s black revolutionary mouth” as the cameras moved from Baraka to the hundreds of sobbing attendees inside the large church. Although Baldwin died an atheist, the pulpit played a big role in his writing and was a marker for what he understood as one of the powers dividing blacks and whites in his day. James Baldwin was a celebrity writer at the time of his death, internationally known for novels such as Go Tell It on the Mountain, Another Country, and book-length essays including Going to Meet the Man, The Devil Finds Work, and The Fire Next Time. We are now privileged to have, in this new edition, his collected poems and the new sounds of his prophetic voice. This collection could not have come any sooner. Amidst our country’s recent race conflicts and injustices, we need Baldwin’s prophetic voice to remind us that love and understanding can do much to transform race relations in the United States. Ayendy Bonifacio is from Brooklyn, East New York. He is a PhD student in the English department at The Ohio State University, studying nineteenth-century American literature with a focus in historical poetics and poetry. He teaches English composition, and during his time off, writes poetry and does photography. James Baldwin. Jimmy’s Blues and Other Poems. Beacon Press Boston, 2013. 120pp. $16.00, paper.